Here at St Joseph's we are commited to promoting life long and engaging learning through the use of technology. In school we teach computing lessons that involve technological understanding, computer sciene and digital literacy skills. We explore the curriculum using many different forms of software, hardware and internet services. Children use the Internet on a regular basis as part of their learning. E-Safety is an important part of keeping children safe at School. We have extensive security measures in place in school, which are monitored both internally and externally, to help safeguard pupils from potential dangers or unsuitable material. Any e-safety incidents are recorded and managed in accordance with our E-Safety Policy. E-Safety is taught to all pupils explaining and demonstrating how to stay safe and behave appropriately online. We can only be successful in keeping children safe online if we work with you to ensure the e-safety message is consistent. Your help is needed to talk to your children about how they can keep safe and behave appropriately online. The children in class 3 discussed the dangers of clicking yes when online. The explored pop-ups, designing some of their own. You can click the links below to see their pop ups. Remember, you should be careful about clicking yes and sharing your details online! Class 4 explored the power of images. We learnt that images last forever online and explored just how much we can learn from an image. Some images we share might even get into the hands of other people, they may be able to get our personal information from them or use them to bully or hurt us. We watched videos and had discussions about all sorts of dangers surrounding online images. Please THINK carefully before you post images online of your children. Our website policy is never to label images with names of children, we do not want everyone knowing who goes to St Joseph's School! The children listed all the information they could find out about someone using a mock facebook account. We found out a childs name, school, mothers name and the clubs he went to! The children in class 4 had a task to create their own e-safety awareness projects. There is an example of our work at the bottom of this page. Later in the year we will watch this video below and answer What if ...? questions. Remember, when you post an image it won't go away! Lots of people will have access to the image and they can use it to find out about you. Here are some images that have become very famous. Why do you think they are famous? What can you learn from these images? * Discuss as a family how the internet will be used in your house. Consider what should be kept private online and decide rules for making and meeting online friends. Make sure you know what your child is doing online much like you would offline. 1 in 4 children arrange to meet someone face to face that they have spoken to online. * Install antivirus software, secure your internet connection and use parental control functions for computers, mobile phones and games consoles to block unsuitable content or contact. Remember that parental control tools are not always 100% effective and sometimes unsuitable content can get past them, so don’t rely on them alone to protect your child. * Locate your computer or monitor the use of a tablet/iPad in a supervised family area. Always supervise the use of webcams and applications which allow voice or video chat. Consider your child’s use of other devices that allow internet access such as mobile phones and games consoles. * Talk to your child and ask them to show or even teach you how they use the internet, learn which websites or tools they like to use and why. Learning together can often open opportunities to discuss safe behaviour with your child. * Always ensure your child knows how to block or report people online who send nasty or inappropriate messages or content. Encourage your child not to retaliate or reply. Screen shots should be kept as evidence, if needed by appropriate agencies to pursue and take necessary steps of action. * Make sure your child knows to tell an adult they trust if they see something online that makes them feel scared, worried or uncomfortable. Explore e-safety sites - There are lots of links to useful e-safety sites for children on the internet. They are great fun to explore, so why not browse through them with your children? Facebook / Bebo / Myspace - Many of these sites have a minimum age limit of 13, so our pupils should NOT be using them. Vodafone Parents - Vodafone have lots of fantastic practical advice for parents. You can also read their 'Digital Parenting'magazine. 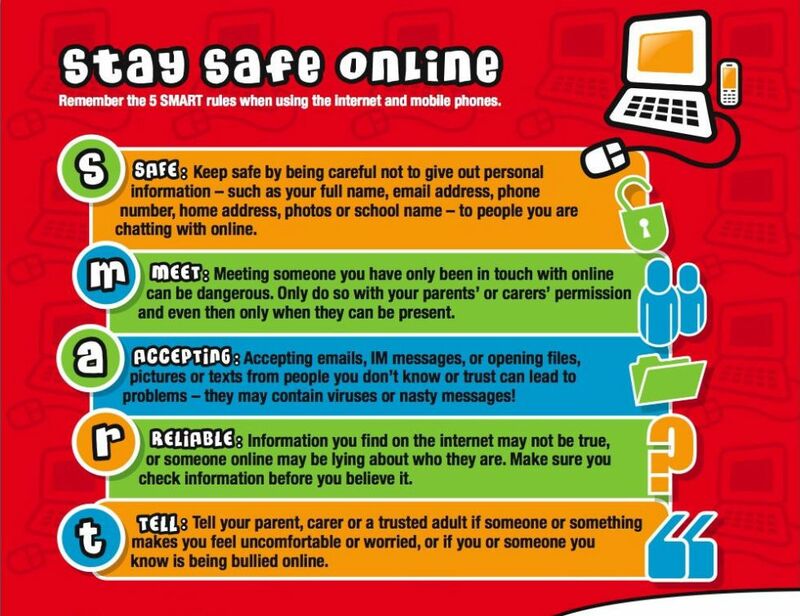 Internet Matters - Simple, easy and practical advice about online safety. Bullying UK - Information and advice about cyberbullying for children, parents and schools. CEOP (The Child Exploitation and Online Protection Centre) - Dedicated to tackling the abuse and exploitation of children in the real and ‘e’ world. Often it is referred to as an online 999. Childline - Free helpline (and website) for children and young people in the UK.